A significant proportion of railway construction firms view their machinery fleet as insufficient to handle the anticipated increase in business volume. At the same time, few believe that PKP PLK will deliver 90% or more of the National Railway Programme 2017-2023. Nearly 80% of railway construction firms active in Poland are planning to invest in new construction machinery and equipment over the next two years, according to a PMR survey conducted in the summer of 2017 for the report “Railway construction market in Poland 2017. Market analysis and development forecasts for 2017-2022”. This is a slightly higher percentage than in a similar survey among road contractors. Two in three railway construction firms also intend to buy new transport vehicles over the next 24 months, a third are planning to invest in IT infrastructure, and more than a fifth in buildings and structures. Less than 10% are planning to boost their potential by acquiring a rival. 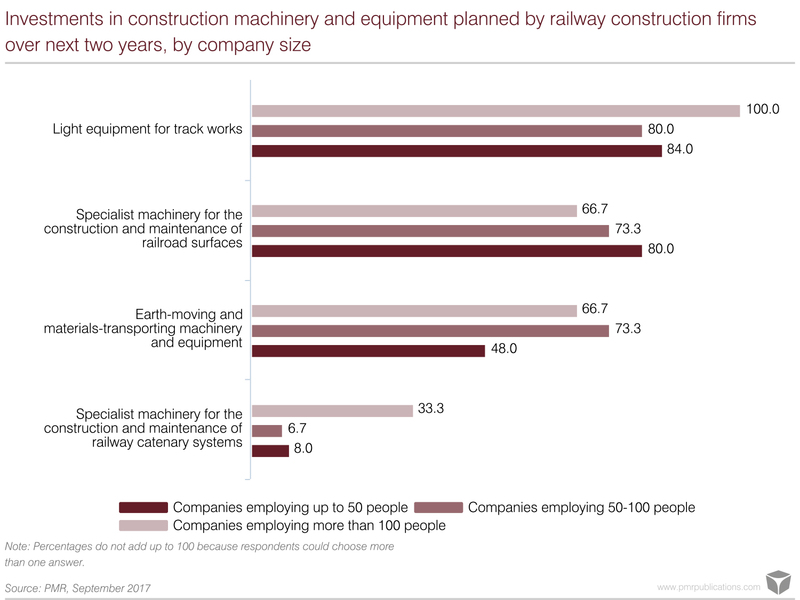 More than a third of railway construction firms believe their existing machinery and equipment fleet is not sufficient given the anticipated rise in business volume. The percentage is significantly higher among companies that rely on subcontractors to execute more than 30% of their work, who employ 50 to 100 people, and who are active primarily in the central and eastern regions, i.e. parts of the country where a significant upturn in investment activity is observed. The proportion planning to invest in transport vehicles is highest among large contractors and firms who subcontract a major portion of their work, especially from the southern and eastern regions. The number planning to acquire a rival is highest among medium-sized and large firms (employing more than 50 people). The contractors planning to invest in new construction machinery and equipment over the next two years were asked specifically what kind of equipment they intended to buy. The most frequent responses were light equipment for track works (virtually all large contractors are planning to strengthen in this area) and specialist machinery for the construction and maintenance of railroad surfaces (mentioned particularly frequently by firms employing up to 50 people). 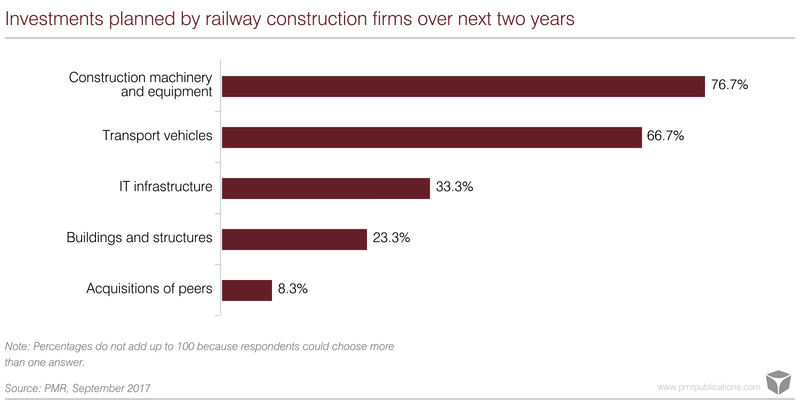 Relatively fewer firms are planning to invest in specialist machinery for the construction and maintenance of railway catenary systems (cited chiefly by the largest contractors). About the report and the survey: In the summer of 2017 PMR conducted a poll of rail construction firms active in Poland for its new report “Railway construction market in Poland 2017. Market analysis and development forecasts for 2017-2022”. A total of 60 interviews were completed with persons occupying senior executive and operational positions. Atlas and Robel are the construction machinery and equipment brands most widely used by railway contractors in Poland, followed by Geismar, JCB, and Liebherr. Atlas and Robel were also the most mentioned brands when we asked our respondents about the equipment they were planning to invest in, followed by Geismar, Plasser & Theurer, and JCB. Our interviewees struck a fairly skeptical note regarding the likelihood that PKP PLK will deliver fully on the investment commitments set out in the National Railway Programme 2017-2023. Only less than 15% expect the state railway company to deliver 90% or more of the plan, with the biggest group predicting an implementation rate of either 61%-70% (23%) or 71%-80% (22%). 13% are more pessimistic, expecting that PKP PLK will deliver less than 50% of the plan.